An exhibition of long-time artists: Anne Apparu, Nico Dios, Cheryl Dunn, Charles Gatewood, Kevin Harris, Troy Harris, Steven Hirsch, Curt Hoppe, LA II, Leslie Lowe, Pete Missing, Angel Orensanz, Jerry Pagane, Clayton Patterson, Elsa Rensaa, Q. Sakamaki, Shell Sheddy, Suzannah B. Troy. Screenings: Captured, directed by Ben Solomon, Dan Levin, edited Jenner Furst & Dirty Old Town, directed Jenner Furst and Dan Levin. To my blog followers: The portrait started out like this...than I added a red background and turned it in to a political poster lampooning Mike but by election night it turned in to ‘The Picture of Dorian Gray” with Mike looking like a space alien turned burn victim. 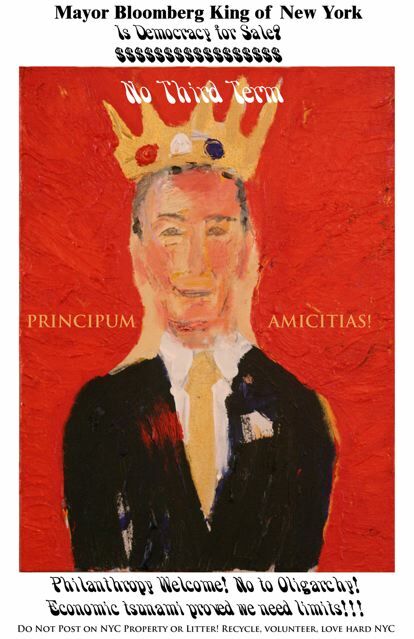 Mayor Mike Bloomberg spent a record amount for an underwhelming win art response Suzannah B. This was a very beautiful yellow phase and I talk about how people saw Munchs The Scream the hands holding Mike’s head but that was not intentional. The first time you see the painting....the beginning stage before I make in to a portrait! Rupert Murdoch Glenn H. Hutchins Mike Bloomberg Why Suzannah B. Troy is banned from The NY Post as a commentor + why the Post refused to report Mike was booed relentlessly Triangle Shirt Factory 100 year Memorial! The 2nd time I was banned from commenting was when the editors had to report on the 80 million dollar theft by Spherion consultants and gee whiz no one in NYC gov from Mark Page to Gartner paid to do quality control on Spherion caught wind of the stealing. When Spherion pitched the 20 percent “deal” to Gartner -- Gartner had one choice only and that was to report Spherion for what sure sounds like extortion to me and Gartner did not. Gartner should have refused to do business with Spherion! Reminder, Matt Damon instructed us to vote for Mike Bloomberg and I do not believe he declares NYC his home because he doesn’t want to pay NY’s steep taxes so he is another rich man telling us to vote for a rich oligarch. Watch this and learn more about corrupt dealings by The NY Post including on a letter they published on behalf of Mike Bloomberg by Mitchel Moss. When you get to the youtube click on the links in the text portion and learn why it was so corrupt. Moss sounds like the sock puppets that harass anyone critical on YouTube, mark us as spam with the goal of getting us banned from YouTube. They use intimidation and are guilty of aggravated harassment. The good news is they like Mike Bloomberg and gang think they are above the law and that is very good news. Well folks that makes two accounts The NY Post has suspended and they say I am self promoting. This would be me self promoting today. I would post on Geraldine Ferrara’s Obit in the Editorial Section Why didn’t The New York Post report that mayor Mike Bloomberg was booed relentlessly with protestors yelling Tammany Hall, “Why did you close our fire houses” in response to Bloomberg using the word safety. Bloomberg talked about construction safety yet under his mayoral leadership we have record amounts of construction related deaths and injuries + infrastructure as well including Con Ed employees and civilians. No New York paper reported Bloomberg being booed which brings us back to the media silencing voices in opposition pre-the election that Mike Bloomberg barely won but The New York Post is the only paper to suspend me -- twice. I wrote Rupert Murdoch and left voice mails with his children who are in my age range. Is this because of Glen Hutchins and Gartner? The NY Post unwittingly revealed that Gartner agreed to pay Spherion a 20 percent kick back on billing and oops Spherion consultants were stealing 80 million -- over billing and Gartner agreed to extortion instead of reporting Spherion and refusing to do business. Does Rupert Murdoch have a relationship with Hutchins as well as Bloomberg and has agreed to silence trouble makers. After all the editors of The NY Post published Mitchell Moss’s letter of lies attempt to refute Fred Siegel’s expose “Bloomberg’s Bubble Burst” and Moss, an NYU employee and on the developer Rudin family’s payroll - Rudin who is a trustee of NYU, NYU that did an illegal air sale next door to my home of 20 years -- and busting through zoning while Moss’s letter in the NY Post says Mike Bloomberg preserved our neighborhoods and praised his zoning when in fact Mike and Amanda Burden approved and facilitated the illegal air sale 120 East 12 by the USPS to NYU and the tear down of St. Ann’s that survived everything all these years from 1847 on except NYU’s greed and need to mega dorm the East Village to death. What is interesting is I was told Moss worked on Bloomberg’s campaign and his false hoods and empty praise of Mike Bloomberg echoed non-stop spam that turned in to aggravated harassment by sock puppet accounts we believe were paid to harass and intimidate Bloomberg’s opposition on the world wide web into silence. By the way, The NY Post editors never stated under Mitchell Moss’s name his relationship to NYU, Rudin and Bloomberg. I had all my YouTubes removed before the election and again we believe this was done by Mike Bloomberg and gangs people but like Haggerty, Mike Bloomberg can cry -- he is just too rich to know where and what is being done with his money, when in fact Mike funneled money to Haggerty 2 elections in a row, this past one via the Independence Party and the prior one via the Republican Party. When you see Bloomberg being booed and it is startling and you know the main stream media is not reporting it == you have to ask why and again just like Bloomberg’s dirty tactics to steal a third term and the media helping him because The NY Times and NY Daily News owners like Mike have a special relationship with Steve Rattner who was busted for pay to play NY Pensions, it is just startling how our major New York newspapers are in league with silencing voices in opposition. An activist made a Wiki page about my YouTube’s being removed before the election -- censorship and Wiki removed it as well! The editor in charge exposed that account was under attack from sock puppet accounts and suspended two accounts that called for the immediate removal of the page on my censorship but the editor took it down because Wiki said I had not had enough news published about me and gee um why would that be? Today New Yorkers and the Global Audience know you are all witness to a continued cover-up on behalf of Mike Bloomberg and his friends and the fact that the newspapers refuse to report that Bloomberg was booed relentlessly is hard to believe and an indicator that the powers that be are covering up for a lot more. Bloomberg’s third term scandals are gathering steam like Ed Koch’s third term. In the above YouTube you can hear them yelling “Tammany Hall”. Dear Post Editors -- if I had posted this as a video response - Why would this be self promoting why would this be so threatening to you that you would have to ban me will The New York Post allows the most Racist Anti-Semtic and Misogynist comments up? You would think the NY Post would come in to the 21 st century. The NY Post is the only website that you can’t read comments or post them from an iphone and ipad. It is almost hilarious that the NY Post accuses me of self promoting when their website plugs their TV show and everything possible to make money but The NY Post Editors and now it appears Rupert Murdoch want my voice silenced. By the way, Gartner was not punished for agreeing to pay Spherion 20 percent of what they billed which is like Mafia extortion. Why is this completely hidden except for one article by Sally Goldenberg that perhaps The NY Post accidentally published. Is this one more reason why I am not allowed to comment on The New York Post. NEW YORK - At a ceremony commemorating the 100th Anniversary of the Triangle Shirtwaist Factory fire, Mayor Michael Bloomberg was loudly booed by labor activists and union supporters, Agence France-Presse reported. Mayor Bloomberg had been delivering a speech about fire safety when activists began to boo the unpopular mayor. The ceremony took place in Greenwich Village, outside the building where the fire broke out on March 25, 1911. The building is now owned by New York University. 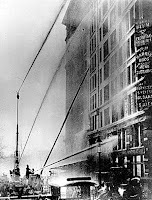 Today's ceremony was marking the deaths of 146 people at the Triangle Shirtwaist Company ; the outrage following the fire and deaths resulted in reforms in labor laws in New York and around the nation. http://www.councilpedia.org/index.php?title=Christine_Quinnhttp://truenewsfromchangenyc.blogspot.com/2011/03/kruger-and-his-friends-have-brought.html Scroll down on true news until you get to christine quinn. Reminder Christine Quinn got herself a speech writer and a luxury condo in a buildings she used tax payer money to smooth the way re: some garbage issue next door and she is back to this crazy idea we believe what she says but New Yorkers are not stupid. We know when Mike Bloomberg and Christine Quinn talk to read the sub-titles as in lying and full of bull-loney. Quinn sold the great lie we needed Mike to help us with the economy. Has he helped you? No! Read The New York Daily News every day as they expose the real Christine Quinn instead of the phony puff pieces that have been strategically place on behalf of her mega-rich pals that want her in office so Mike can have a fourth term. The NY Daily News reporters already exposed Christine Quinn was sued 4 times for not paying rent and she wants to be our mayor! She said we need Mike to help us? Well she can’t come up for money for the rent but she magically has money for a condo and a speech writer? http://truenewsfromchangenyc.blogspot.com/2011/03/kruger-and-his-friends-have-brought.html scroll down until you see this! City Councilman Ruben Wills OutStanding Warrant exposed in contrast The NY Times did a puff piece glossing him over! Powerful piece and disturbing how The New York Times did a puff piece like they have with Mike Bloomberg and they guy has a criminal past. He is not a felon but really awful. NYDNY doing a series on corruption NY City Council! Christine Quinn City Council's Dirty Secrets + Quinn's Slushgate! Read the above link and try not to fall out of your chair when you read about the corrupt politicians that are cheating, lying, not paying taxs, rent, fees that would land us in jail! Get out your barf bags because it will make you want to puke! Link below Sally Goldenberger’s piece on Quinn and staff’s high priced defense attorneys! Can we get an App and having a running ticker on the on going high costs to tax payers thanks to corrupt politicos and their staffs? How approved the same law firm Goldman Sachs uses? Google Blogger Censors NY Political Blogger Gary Tilzer -- Tilzer blog removed over night! Gary's powerful work telling the truth about special interest groups and corruption by some of the most powerful rich players on the NY scene just vanished courtesy of Blogger Google and we believe his 1st Amendment rights have been violated. If his blog is not returned by Monday morning would you write a letter like you did for me to Google when my YouTube channel was removed a month and half before the mayoral election. If this wrong is not righted people will leave Google products like YouTube and Blogger. Gary Tilzer made this YouTube with Doug Bivano when he was running for NY State Assembly and the YouTube starts in front of John Peter Zenger’s unmarked grave Trinty Church . NBC reception/security after consulting with NBC lawyer asked YouTube to remove this YouTube and it was banned. What you are seeing is the 2nd version minus a few seconds that showed the security guard’s face. I said don’t believe the press, Mike Bloomberg may not win the election due to voter anger! Suzannah B. Troy and Gary Tilzer Banned in the 21st Century for telling the truth. Suzannah B. Troy The Morgan Library! I don’t have kids -- at least yet (and I am pushing the big 50 in a year and a 1/4!) so I took my favorite teenager to the Morgan. We looked at the various portraits of Shakespeare and front and center is the one of him as a young man with the Latin “Principum Amictias” which I took and used to lampoon Mike Bloomberg in my art poster protesting his third term! 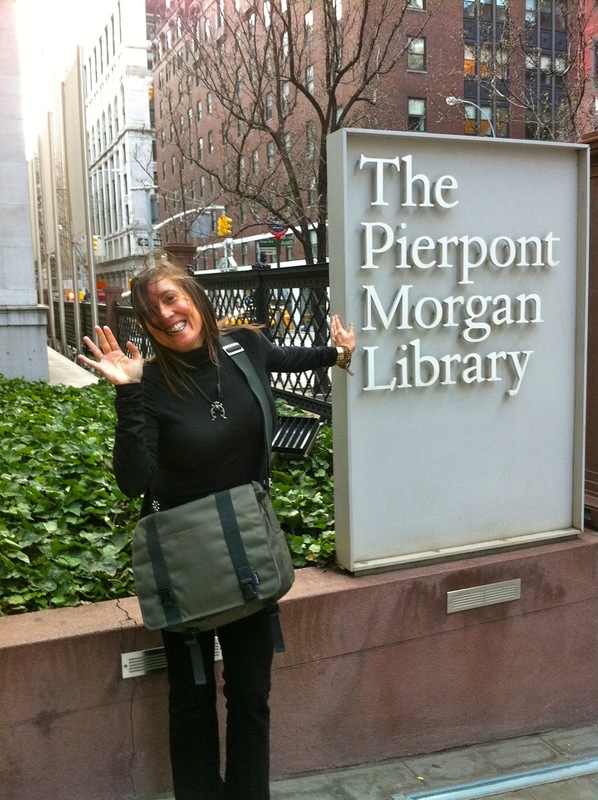 She had never been to the Morgan before so I showed her J. P. Morgan’s library. I asked the guard to tell her about the hidden passage ways in the book shelved walls! The ceilings alone in the central library room are breath taking with mythological imagery and astrological symbology as well. I showed her letters hand written by George Washington, John Adams and Thomas Jefferson as well as a mask of George Washington’s face. We looked at the back and say the artist’s signature. They have copies of the mask of George Washington face for sale in the book store but I don’t think they sell many! We looked at the exhibitions of journals of Albert Einstein which my young friend found fascinating as well as John Steinbeck, Tennessee Williams, Nathaniel Hawthorne and there were many more including an art pad showing Bob Dylan’s artistry. It was so wonderful to see a teenager’s eyes open with excitement and enthusiasm. Great fun! Sally Goldenberger may not have known she exposed Glen Hitchins when she did this superb piece of reporting most people did not see and Sally won’t get an award for this piece but maybe she should. Go back and take a look at the original post -- I added some links on Skype etc. Why oh why was Spherion (hired to do quality control) allowed to pick who was suppose to quality control them on CityTime? Why do we need so much quality control? Why did we, NYC gov cut off Spherion but not Gartner who is involved in “Quality Control” big time NYC? FYI: Contractors don't have to take an oath like a city employee does -- why are we outsourcing to over paid consultants -- why not direct hires? We are closing fire houses, schools, lay-offs but no cuts to “quality control” big time tax payer guzzlers and in my opinion Gartner is one as well as directly implicated in CityTime scandal but mysteriously unscathed. Read the real reason Christine Quinn told the great lie we needed Mike Bloomberg for a 3rd term to help us with the economy and why real estate developers and techno-magnates want Christine Quinn, Mike’s mini-me/puppet in for a third term. Sally Goldenberger exposed Gartner last year and guess who owns Gartner -- Mike Bloomberg’s good friend Glenn Hutchins, his company is exposed for indirect kick-backs or paid to fail on CityTime in the article post above that Goldenberger wrote! Gartner is completely exposed in this article as failing to do their job but they remain in place and deeply so being paid big bucks for their consulting NYC gov as we have massive cuts and lay-offs!!!!! p.s. How did Gartner even agree to this deal with Spherion? Apparently is seems almost everything NYC gov must be run by the uber over paid Gartner...? The longer things fail the bigger Gartner gets paid. Does Gartner run NYC gov.? If you got this far and did not click on the link do it --- and scroll down to the bottom to see who signed this open letter! Does Mike Bloomberg see Glen Hutchins reflection looking back at him when he does look in the mirror? p.s. Ellen Stein is Bloomberg’s sister’s best friend and she is one of the heads of DOITT along with Patricia Harris step-son Michael Lebowe and they are paid big bucks as are all Bloomberg cronies. BLOOMBERG IS A TECHNO-CRAT -- HE NEEDED TO GET IN FOR A THIRD TERM TO LOOK AFTER REAL ESTATE AND MAJOR TECH DEALS -- TECHO-FAT CATS ALL AT THE EXPENSE OF NYC TAX PAYERS ROBBED IN THE WORST WAYS -- IN OUR FACES AND NYERS DON’T EVEN KNOW!